who equate Zionism with racism. our country as well," Wiesel said. able to leave the Soviet Union? able to live as Jews without fear. strive to do so many things . Page 2 Tbe Jewish Floridian of Tampa/Friday, September 6. To jtmi kealth. Got. Bob Grakaa has appointed Dr. Peter J.
LeTia, dean of the Cotiesje of Public Health a: USF. t<. state decision makers on policies about health care costs. studied and worked in New York. California and Oklahoma. St. Petersburg. Great-grandmother i Ethel Florence. St.
Petersburg, and her big brother :s Daaiel. age 5. Esther spent a week in San Francisco. Shayaa Marlee was born Jury 24 to Sheila aad Saad? J. Bogaa of Scottadale. AZ Her great-grandma. Patricia aad Carl Fierstein _m August 12. weighing 8 pounds. - cfa. Switzerland where they both studied Jungian analysis. Mazol toT aad welcoaae to tob all! their 25th anniversary. Mr. GoidensteiE organized the schooi. tion, so. speaking a half dozen or so languages cornea in handy. Meet the Minkiaa. Six years ago. the Yury Minkm family. l sandwich was owtfiarsted they were allowed to leave. told them they were going to Baltimore. New York? Boston? Los Angeles? The Minion's decided to travel to Baltimore too. while we know they mass their family in the Soviet Umoa very. Roch Hashanah Sunday. Sept. 15. 7:30 p.aL. Monday. Sept. 16. 9 am. at I if IiiSi hone) 7 p.m.. Tuesday. 6 p-m.: Saturday. Sept 21. 9:30 am. Miaea. 5:45 p.m; Neilah. 6:15 p.m.
7 HavdaUah. 9:15 pjn. : Progran-. and Reception. 9:30 pjn. ; Service. Roan Hashanah Sunday. Sept 15. 8 pjn. : Monday. Sept 16. 9:30 a.m.
fottowinf Senrice. Tuesday. Sept 17. Shabhat Shavah Friday. Sept 20. 8 p.m. Saturday Sept 21. 10 am. Torah Service. 11:15 am: Sermon. p m.. Shoiar. 7 50 pjn. Rose Hashanah Sunday. Sept 15. 6:15 pjn. and 830 p.m.: Monday. CoaUren s Service. 2 pjn. 615 pjn. and 8:30 pjn.. Wednesday. Roah Hashanah Sunday. Sept 15.
vice. 830 am; Shathiith. 9 am..
aav; Shoiar Service. 1130 am..
Torah Reading. 10:15 am. Sermon. 11:20 am., Yukor Memorial Service. p.m.. Maanv and Sbofar at Dusk. host the Break The-Fast Reception. Yom Kippur Tuesday Sew o.
accornrnodations will make a success of your Wedding. Bar Nlitzvah. Banquet, Business Meeting or Reunion. Department far information or please call 879-5151. Iput down new Jewish roots. The concept has caught on. are to be scheduled for 1986.
promises to tie YAD' best. cil and projects related to Israel. Postmaster Send address changes to The Jewish Floridi..
bBjD debt bare aot changed. tbe OJft fare ap tbe Phmppasea. ufanad to give ap Peart Rxo. woasd hare oc laraei Tbe offiea. to sustain vital social welfare programs. life, is in the minority. in the case of the Jewish people! as Egypt, Assyria, and Babylonia. state and has lived in the diaspora. k for them in the freezer section! imi Beach ^L Menaeison. nc. people to humanity as a whole. where this downsliding is to stop? recognize the Reality and Truth. nteOUR GANG, do 7V Janet Flon&a*. 2806 Horati! Marilyn Weissman^^ The Stork Route. Inc.
us at Pfantscbewitz Wine Co.
JT. Jl *^ TV. ICT1L i <^ J 5*UOT. pCXS 31! ^*rsrwnt irn^ ar*. rax. -rar rx za!? 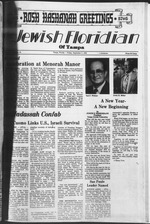 j f.
Friday, September 6, 1985/The Jewish Floridian of Tampa^_Page_! That is the precedent we will set. and that is defending us. this high school in Israel. for the Fall "quin" in Israel. 3919 Moran Road 962-6888 Rabbi H. David Rom. Cantor San Isaak S*w.
Orthodox Minyan in Carroll wood area Friday night at 7 p.m. and Saturdav mm. B'nai B'rith Hillel Foundation. Jewish Student Center, University of South FlorA. day Bagel Brunches, 12 noon. General Assembly, to be held Nov.
Jewish poor and "near poor." more than 5.T million in the U.S.
changes in the area of subsidies. We have traditionally defined a.
subsidy as a "bounty" or "grant"
cofflnwnlctlkMi thst mikes good sense! $995. per person dbl. occupancy. Prteae based on July exchange rate. border, and we wouldn't ariH. that free trade can be good for the! was one cause of World War 1! Free trade can aid world peace.! * Excerpted from an editorial ts! "Oh, lonesome-* a M pjs*! in every generation are admonish- Abilities of Jewish peoplehood. Xy know whaTlife 'was ~ IJ^SiS? J ^ ^ V"**' ^ "
listen carefully to one another. nent and support for Israel. ey, Judge Martin L. C.
xonial dinner are John A.
better, is an outreach program. Open 1030tin. tof p.m. Mon. Sal. to Florida State." he continued. have worked on their campuses." First Church of God, 2203 E.
$35 (sliding fee scale available). Join us at "New Directions!" kwing over our despair .. .
^nslate out thoughts into deeds. ere they might be arrested. fwisn music and old favorites! 10 a.m.. in the library of the JCC. swimming, a cookout and more!!!! second appeal for Israel Bonds. participate in this worthy cause. the office in Tampa, at 988-7076.
through the doors than ever. Please RSVP to Sylvia Krone. 1219 E. Hanna, Tarm* *. May we all be inscribed in the "Book of Life"
for a healthy, good, and sweet year. World's Largest Producer of Glace fruit a and Peels . vone is welcome to attend. iif>f>). if you can help. On Monday and Tuesday, Sept.
will perform the Shofar ritual. me personally or by mail. at the Temple. Dr. and Mrs.
ingarten, Sarasota; Mr. and Mrs.
Jamie, Sari, Seth, and Daniel. 9-5:00 Sat Bobby E. Bobo R.Ph. On September 3, Thanks To YOU! psychic who will speak with us. their '-ar off the road? held in the Temple Sanctuary. cash bar, and live entertainment. COMMITTE MEETING OPENING MEETING 5:50 'JEWISH COMMUNI- FUND "TREE OF LIFE"
PjEWISH WAR YOM KIPPUR M0 BUSDVES8 PROP. NEWISH COMMUNI- CENTER CLOSED P.M.
[OR ATK SUKKAT CANDLELIGHTING TIME SEPTEMBER 28-7 P.M.
it this very moment! 872-4451.
from 3:15 to 4:15 starting Sept. 3.
holidays and the Center is closed. on Sunday afternoons, 1-4 p.m.
tion. Cost is $2 each Sunday. to start Sept. 8 and end Nov. 24. Group in the Tampa Bay area. You have your own special group. happenings in the future which! Sept. 12 at 5 p.m.
Yours, come and have some grins! AUDITIONS!! "MY FAIR SADIE" AUDITIONS!! tasy everyone dreams of being a star! weeks or more in advance. This is how your year begins!! one will be on Sept. 28, from 7-11.
will be $1 per person. will be decided that evening. later), and (3) Pay a $1 fee. palm leaves oh so long. evenings at 7 p.m., starting Sept.
munity and will be well attended. you would like to be offered. given to winners and runners-up. Carp, Louise Eatroff, Carol* E wen. Dr. Port, Dr. Bonnie Saks. Esther Sefall, Dr.
Al Ward, Rabbi Barger, Rabbi Mallint*t.
Sept. 8 "My Fair Sadie"